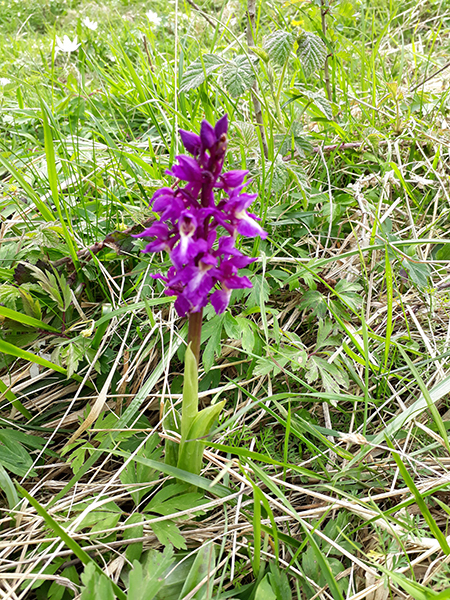 The early purple orchids were in full bloom at Brockadale today, in the woods as well as the meadows. I also had a raven fly over. 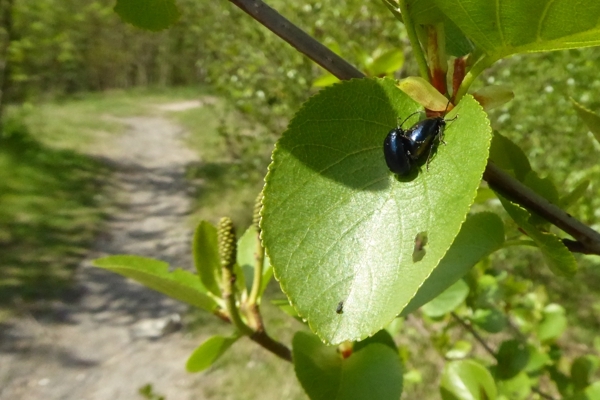 I was walking around Fitzwilliam Country Park this afternoon when I spotted lots of metallic black/blue beetles on the leaves of an alder. I think the alder is Italian alder (Alnus cordata). 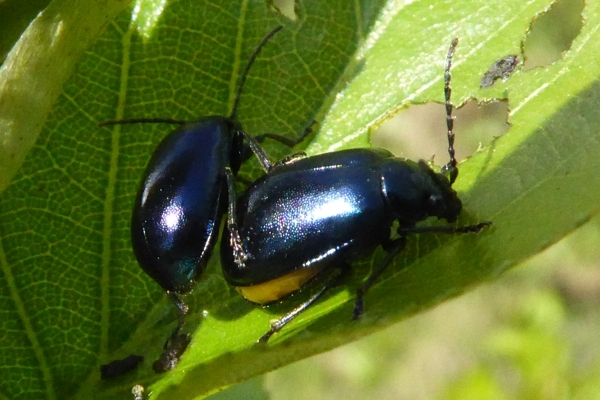 I believe that the beetles are Alder Leaf Beetle. 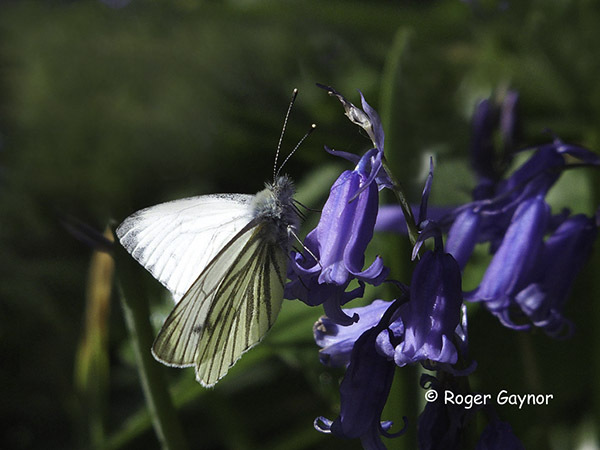 This species has been absent from the UK for about 60 years and it began to be recorded again in about 2004. 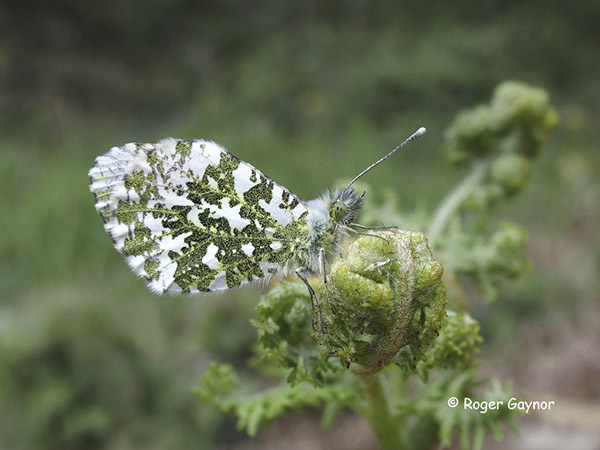 It is likely that it was reintroduced to the British Isles by the plant trade. There were many beetles on this and other trees, singles and mating pairs. You can see holes in the leaf in the picture above. This species causes significant damage to alder and can reduce leaves to skeletons. 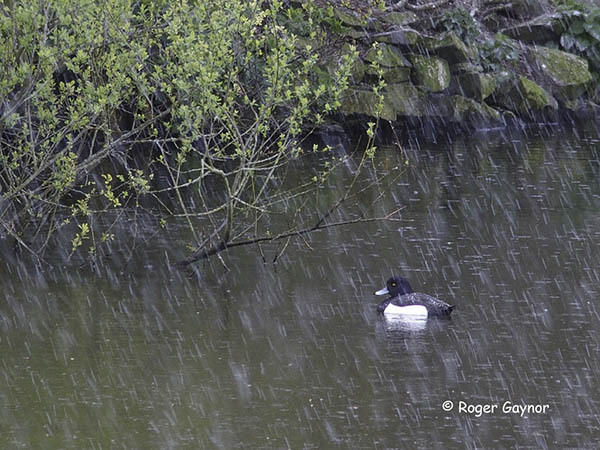 It was recorded at RSPB Old Moor in 2012 and it has been recorded at Wintersett since 2013. The weather has been a bit cool but I have put out the moth trap on a couple of nights this week. 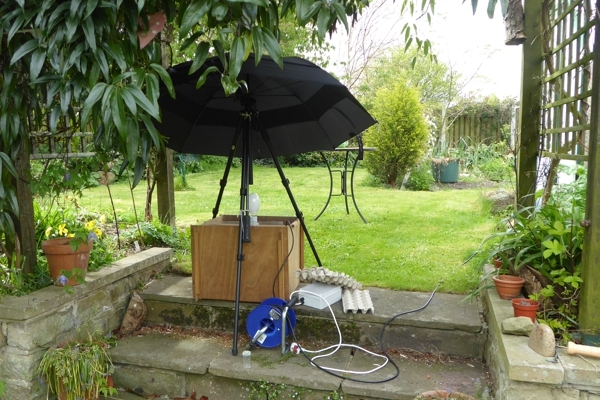 There was a threat of some overnight drizzle, so I used my usual arrangement of a tripod and umbrella to protect the mercury vapour bulb, which might shatter if exposed to rain. The catch was much lower than I would expect on a summer night, only two moths on each occasion. 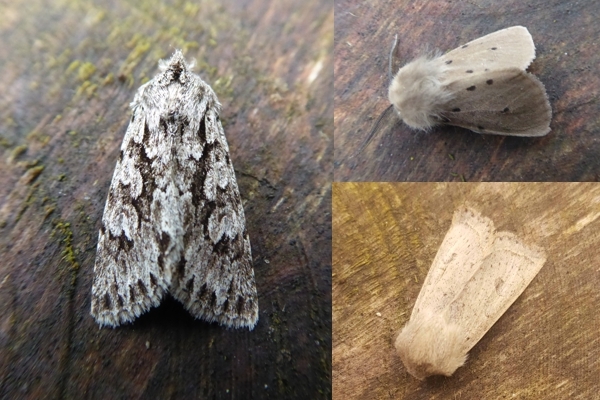 The first night produced early grey and a male muslin moth. The second night gave another early grey and a powdered quaker. All of the three are common but it was the first time that I had caught powdered quaker in my garden. This brings the total number of macro-moths found in the garden to 89 but I think there is further to go because I regularly log new species. 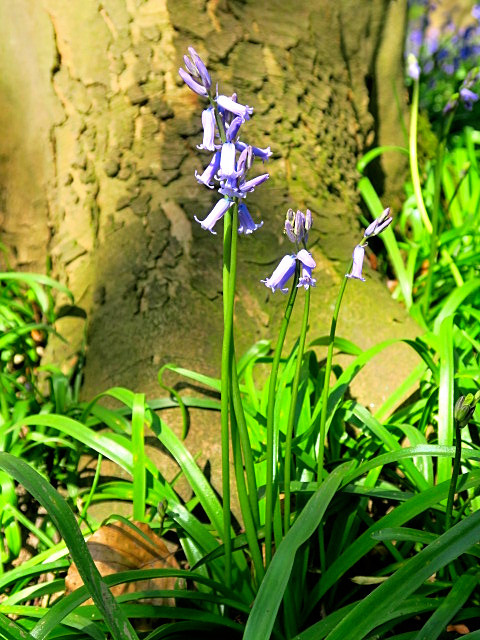 We had a walk from our house in Ryhill to Newmillerdam in the superb spring sunshine going via Haw Park and the Walton Canal. 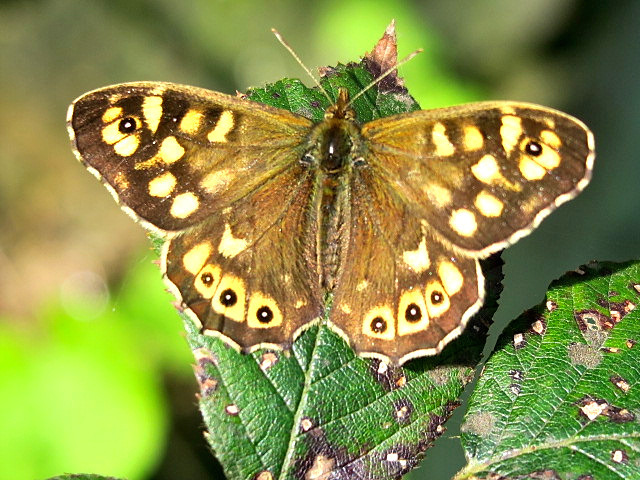 Grass snakes have been seen regularly along the canal of late but we weren’t lucky enough to come across one thought there were plenty of butterflies such as orange tip, brimstone and speckled wood. 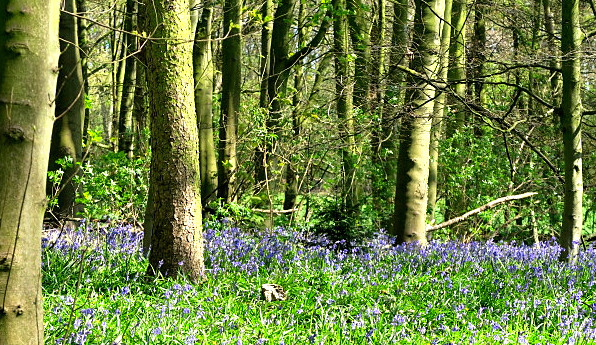 The bluebells at Newmillerdam were really just coming into bloom and are looking excellent at the top end of the country park. It’s interesting to see the rangers have completely cleared Newmillerdam of all rhodedenrons so there are some large bare areas but, given a couple of years, these will revert to the natural understorey. This year’s clutch was completed with the laying of a fourth egg just after 3 a.m. on 1st April. The birds have, therefore, been incubating for a little over two weeks and they are well into their usual routine. The female incubates throughout the night and the male takes over for an hour or two early in the day. He usually returns to do another shift – often lasting 2 to 4 hours – in the afternoon. 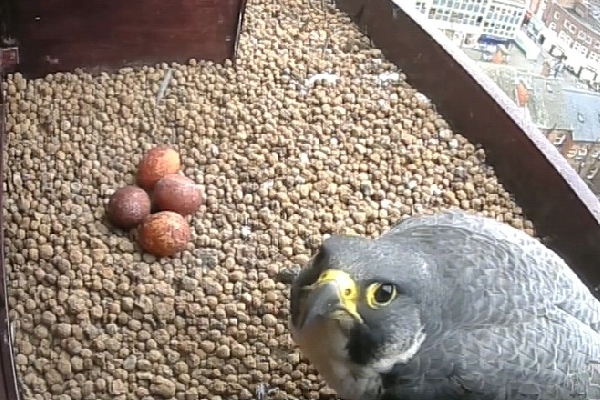 Peregrines begin incubation with the laying of the penultimate egg, which was on Wednesday, 29th March. Last year, the first hatching was 34 days after the laying of the third egg. 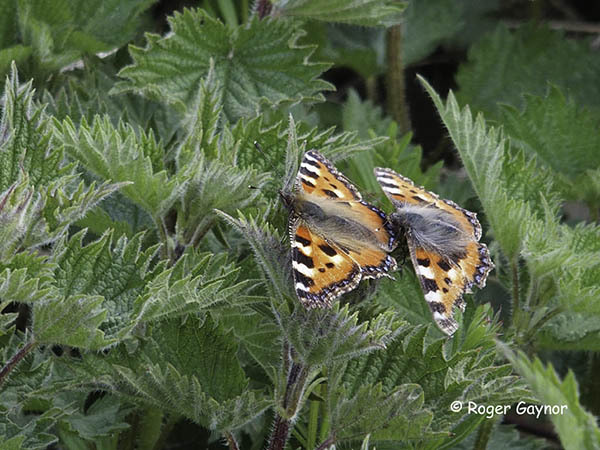 Using this as a guide, I would expect the first hatching this year to be on Tuesday, 2nd May. Factors such as the outside temperature can affect incubation time, so this date is only a guide and hatching could begin a day or two either side of this date. The first three eggs should hatch very close to each other and the fourth egg should hatch a couple of days later. It’s the time of year for morel mushrooms to appear but they can be hard to find. 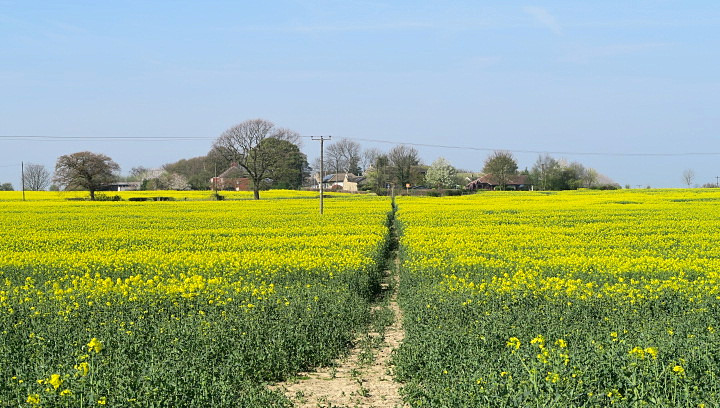 They are significantly less common in the north-east of England than in some southern counties and they are more numerous in some years than others. It was pleasing, therefore, to hear a report of some interesting mushrooms appearing amongst some bark mulch in the garden of a house at Stanley. When a couple of us investigated, we found two species emerging from amongst the wood chips. 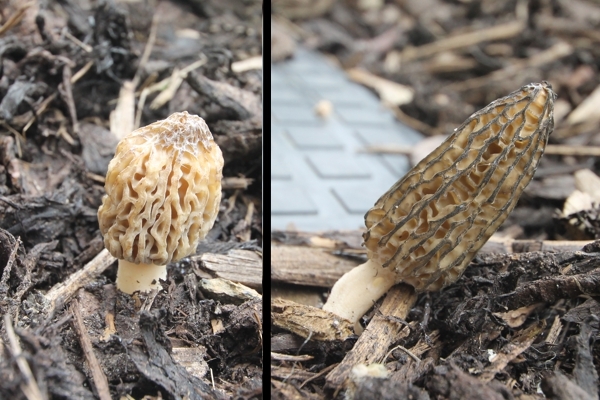 We saw several black morels, which we decided were Morchella elata, but we have since been informed that this name is out of date and they should now be called Morchella importuna. One of the morels was different from the others and we decided that this was the true or common morel, M esculenta, but the best information that we have at the moment is that this is of the same species as the others. 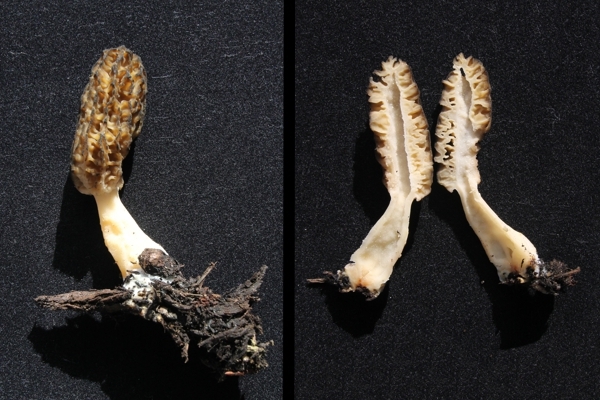 I understand that the exact number of species of morel has not been agreed by all and the relationships between the different morels are being studied using DNA analysis. 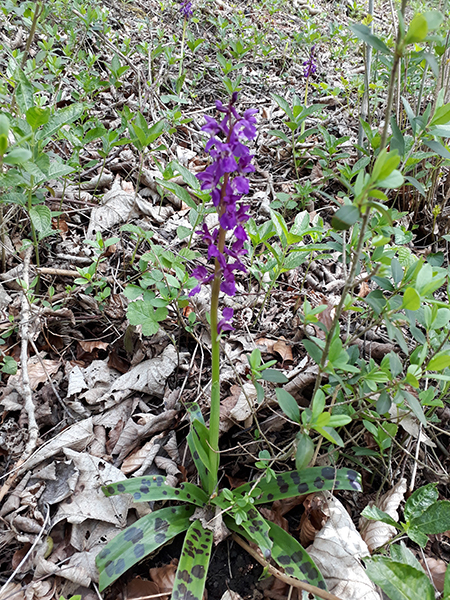 Colour can’t be relied upon for identification. Morels are sought after by mushroom enthusiasts because they are considered to be delicacies. They are picked in many countries and they are often dried and stored to be eaten later. Having said this, there are some very toxic lookalikes and you must be warned against trying to identify any edible fungi by using information from an article such as this. Always get an expert to identify anything that you intend to eat. 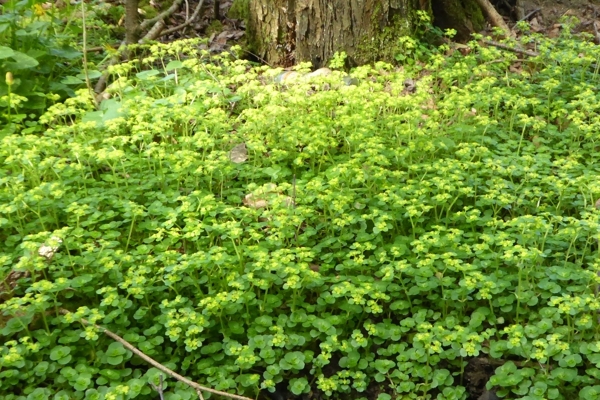 During a walk at Howell Wood, South Kirby, I found masses of opposite-leaved golden saxifrage (Chrysosplenium oppositifolium) in flower along the banks of a stream. 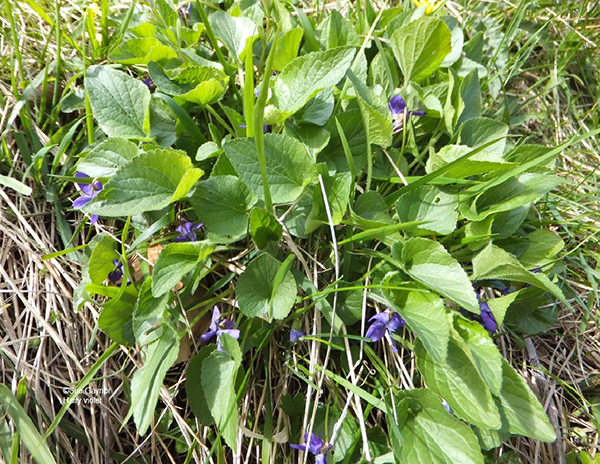 This is an attractive and common plant but it isn’t as well known as some of the other spring flowers. Lots of chiffchaffs are now singing in local woods. 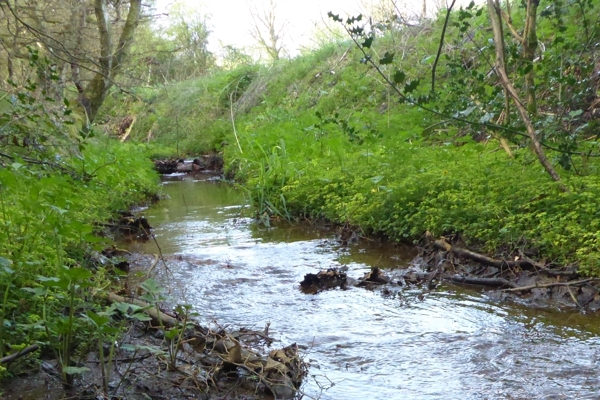 I heard blackcaps in Seckar Wood at the weekend and they have been singing at Stanley Ferry Flash today. An interesting sighting reported today by Mark Archer is a little ringed plover on the new balancing pond at Stanley Ferry.